This lovely little house is shared with family and friends for holidays and get-togethers. It needs to be lived in, so we’ve made it available for visitors. We call it The Bird House because there’s never a moment in daylight you can’t see birds flying or diving nearby… there are guillemots (called ‘tysties’ in Orkney), gulls, terns, herons, ducks, eiders, bonxies, crows, dunnocks and LBJs, murmurations of starlings, and—very occasionally—a kingfisher! You can also see and hear a colony of seals across the bay on the beach of the Holms, the small islands that protect Stromness harbour. Situated in central Stromness on the end of a pier—you could fish out of the kitchen window if you felt inclined—The Bird House offers comfortable holiday-hideaway accommodation for a couple… or a bargain holiday for a small family—accommodating a child or adult on a fold-out bed in a tiny cupboardy-room, and a couple of kids on two sofas, bedding provided. The main living room contains a lovely kitchen—with views across Scapa Flow—and breakfast bar, a comfortable lounge area with two sofas, TV, wifi, books and games. The bedroom has a king-size bed from which you can look across the harbour (at the Shopping Week or New Year fireworks, if you’re here at the right time). There’s an electric shower in the modern bathroom, and a washing machine, just in case. On sunny days—and light nights—you can sit out at a picnic table on the almost-private pier. Orkney’s second town is a jewel, waking into brilliant dawns across Scapa Flow, old stone houses clustered around a fine natural harbour. Celebrating citizens such as George Mackay Brown and Gunnie Moberg , it’s also the home of the International Centre for Island Technologies, renewable energy research, Orkney Fishermen’s Society, supplying crab and shellfish to the UK and Europe, the fantastic Pier Arts Centre, Stromness Museum, and a multitude of societies and events, including West Side Cinema, the John Rae Society and Orkney Folk Festival. All this on top of amazing world famous archaeology sites at Skara Brae, Maes Howe and the Ness of Brodgar and the varied and beautiful natural landscapes of Orkney. You’ll find great resources for your trip at Visit Orkney, and a useful list of Orkney’s attractions on TripAdvisor. 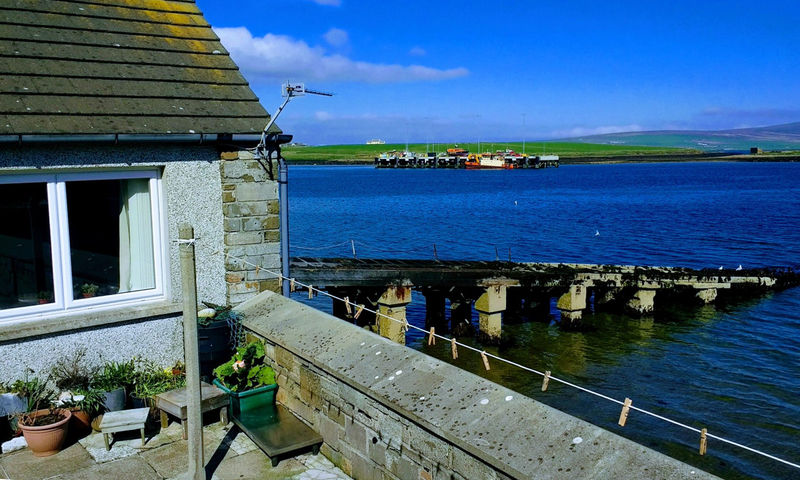 There’s more going on than you could possibly manage in a week – see the Stromness ‘what’s on’ page to get a flavour, or listen to the daily list of Orkney events on BBC Radio’s daily round-up in Around Orkney, which will also introduce you to the unique and lilting Orkney accent. If you’re interested in staying for a week—or more—during 2019 please get in touch and let us know the dates you would like to come and the number of people in your party. We will respond as soon as possible and send you details of the house with photos and further information. Bookings run Saturday to Saturday, arrival after 2pm, departure 10am. Fees include bedding, towels, cleaning, electricity, wifi, and a selection of local food supplies, basic cooking ingredients, tea, coffee and biscuits. And ice in the freezer for your drinks. During the off-season it may be possible to book a shorter stay, and over weekends — please ask if you have other timings in mind. Local charities may book at reduced rates during the winter months for special visitors and guests — please email info@stromnessbirdhouse.uk if you would like to discuss such an arrangement. Contact info@stromnessbirdhouse.uk for further information, photos and booking information.